Here you can discover more about Avie’s international roster featuring such artists as Michael Tilson Thomas and the San Francisco Symphony, Lorraine Hunt Lieberson, Julian Bream, Jon Lord, Antonio Meneses, Vasily Petrenko, Trevor Pinnock, Monica Huggett and Andreas Haefliger to rising stars such as pianists Inon Barnatan and Alexandra Silocea, tenor Nicholas Phan, violinist Augustin Hadelich and conductor Kenneth Woods. 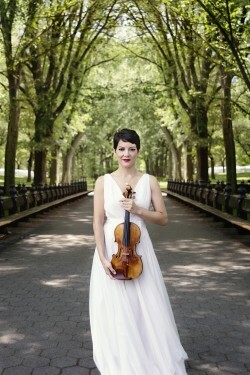 Violin superstar, Anne Akiko Meyers, is one of the most in demand violinists in the world. Regularly performing as guest soloist with the world’s top orchestras, she presents ground-breaking recitals and is a best-selling recording artist with 34 albums. Named Billboard’s top-selling traditional classical instrumental soloist, her albums have debuted at #1 on the Billboard classical charts. Meyers is known for her passionate performances, purity of sound, deeply poetic interpretations, innovative programming and commitment to commissioning new important works from composers. This spring, Anne performs the world premiere of Einojuhani Rautavaara’s Fantasia, his final work written for her, with the Kansas City Symphony, conducted by Michael Stern. She performs new compositions and traditional repertoire in recital in Florida, New York, Virginia, Washington D.C., and returns to the Nashville Symphony performing the Bernstein Serenade with Giancarlo Guerrero. In May, she will headline the Kanazawa Music Festival performing the Beethoven Concerto and Mason Bates’ cadenzas with the Orchestra Ensemble Kanazawa, “Archduke” Trio and “Spring” Sonata #5 during Japan’s “Golden Week”. Recently, Anne toured New Zealand with the Mason Bates Violin Concerto and New Zealand Symphony and returned to Krakow and Warsaw, Poland to perform the Szymanowski Concerto and Jakub Ciupinski’s, Wreck of the Umbria. She also performed in Cartagena, Colombia and led the Orpheus Chamber Orchestra with the Vivaldi Four Seasons. Anne’s 35th album, Fantasia with works by Rautavaara, Ravel and Szymanowski, recorded with Kristjan Järvi and the Philharmonia Orchestra, will be released on Avie Records in October, 2017. She will also premiere Adam Schoenberg’s violin concerto, which she commissioned, with the Phoenix and San Diego Symphony Orchestras and a new work by James Newton Howard with the Pacific Symphony, led by Carl St.Clair in the 2018 season. Anne appeared in a nationwide PBS broadcast special and on a Naxos DVD featuring the world premiere of Samuel Jones’ Violin Concerto with the All-Star Orchestra led by Gerard Schwarz and the French premiere of Mason Bates Violin Concerto with Leonard Slatkin and the Orchestre de Lyon. Two new recordings and a box set were released – Naïve Classics celebrates Arvo Pärt’s 80th birthday with Passacaglia: Arvo Pärt, works for violin and orchestra whom she collaborated closely with the composer, led by Kristjan Järvi and the MDR Leipzig Orchestra and Serenade: The Love Album, an album featuring Leonard Bernstein’s Serenade and ten newly arranged pieces from the American Songbook and classic movies, with the London Symphony Orchestra, Keith Lockhart conducting. Anne’s complete RCA Red Sealrecordings are now available on Sony Music. Meyers also stepped in on 24 hours notice to perform and lead the conductor-less Orpheus Chamber Orchestra in the Mendelssohn Violin Concerto in Carnegie Hall and Pennsylvania. The American Masters album, features the world premiere recordings of the Mason Bates Violin Concerto, a work she co-commissioned and premiered with the Pittsburgh Symphony and Leonard Slatkin in December 2012 and John Corigliano’s ‘Lullaby for Natalie’ (written for the birth of Ms.Meyers’s first born daughter) and the Samuel Barber Violin Concerto, with the London Symphony Orchestra, conducted by Leonard Slatkin. This recording made Google Play’s Best of 2014 and was heralded by critics and audiences alike. Anne’s prior releases the Four Seasons: The Vivaldi Album, debuted at #1 on the classical Billboard charts, as did Air: The Bach Album, and the Vivaldi was the recording debut of the Ex-Vieuxtemps’ Guarneri del Gesu violin, dated 1741, which was awarded to Meyers for her lifetime use. A champion of living composers, Meyers collaborates closely with many of today’s leading composers. She adds new works to the violin repertoire, commissioning and premiering works by composers such as Mason Bates, Jakub Ciupinski, John Corigliano, Jennifer Higdon, Samuel Jones, Wynton Marsalis, Akira Miyoshi, Arvo Pärt, Gene Pritsker, Einojuhani Rautavaara, Somei Satoh, Adam Schoenberg and Joseph Schwantner. Anne has collaborated with a diverse array of artists outside of traditional classical, including jazz icons, Chris Botti and Wynton Marsalis, avant-garde musician, Ryuichi Sakamoto, electronic music pioneer, Isao Tomita, pop-era act, Il Divo and singer, Michael Bolton. She performed the National Anthem in front of 42,000 fans at Safeco Field in Seattle, appeared twice on The Tonight Show and was featured in a segment on MSNBC’s Countdown with Keith Olbermann that became the third most popular story of the year. Anne has been featured on CBS Sunday Morning, CBS’ “The Good Wife”, NPR’s Morning Edition with Linda Wertheimer and All Things Consideredwith Robert Siegel and the popular Nick Jr. show, Take Me To Your Mother, with Andrea Rosen. Best-selling novelist, J. Courtney Sullivan, consulted with Anne for The Engagements, and based one of the main characters loosely on her career. She also collaborated with children’s book author and illustrator, Kristine Papillon, on Crumpet the Trumpet, where the character Violetta the violinist, is played by Anne. Anne Akiko Meyers was born in San Diego, California and grew up in Southern California. She studied with Alice and Eleonore Schoenfeld at the Colburn School of Performing Arts, Josef Gingold at Indiana University, and Felix Galimir, Masao Kawasaki and Dorothy DeLay at the Juilliard School. She received the Avery Fisher Career Grant, “The Luminary Award” for her support of the Pasadena Symphony and the Distinguished Alumna Award from the Colburn School of Music.